After the good news that Best Buy is selling the Nokia Lumia 920 for $600 off contract, we now have even better ones from AT&T. 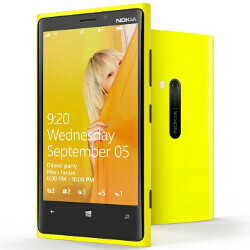 The carrier will offer the PureView-laden Lumia 920 for merely $450 off contract. That’s $200 less than the unlocked iPhone 5, and it is clear that Nokia is doing everything it can to sell this device. On a two-year contract, it costs merely $100 to get the Lumia 920. The device comes with state-of-the-art image stabilization and unmatched low light performance. Still, most reviews agree that it feels too heavy and bulky overall. But at that sweet $450 off contract price, the Lumia 920 definitely seems like a great option, don’t you think? Well, if you want to use the space of your big screen by watching some cool bubble effects or wind patterns, it's okay. And if you meant that you could put stocks, news or weather reports there, you can do it with Windows Phone via Live Tiles. And for your knowledge, with WP8 it is possible to put songs to ringtones-folder and you can use them as your ringtone. And you do not have to use the Zune-software, because these phones support USB mass-storage mode. That also means that you can move photographs, music etc from your phone to PC (and vice versa) without any additional program provided by Microsoft. You can also sync it with itunes. And the last i checked, it wasnt anywhere close to atomic physics, or building a plane. Don't make me laugh. I don't want to hear all this from Apple user. - WP8 has mass storage mode and also supports multiple video codec. Just drag and drop files. - IE10 is great. Every reviewer has praised it for it's phenomenal speed. There are some limitations but will be updated I guess. Third party browsers are coming to windows as now wp8 supports native code. And BTW knowing that you are iOS user, do you have access to the features you are crying about? Where is mass storage? Live wallpapers? Forget tones no one minds it nowdays. I'm glad you mentioned all these features, or lack off. You would think this day and age, especially a platform trying to survive would offer more choices. not bad,but is it only the yellow color?bestbuy selling it $600. no no..
now u can take my money nokia! At $450, the Lumia 920 does seems like a good deal! Wish Nokia gonna sell the 920 for that price in my country. $450 - $600 seems like a good price range though. If you buy from the carrier in the U.S., it is almost always carrier locked. And you have to wait at least 6 months to get it unlocked IF that is even an option. I got my Lumia 900 the week before it officially launched (April) and I couldn't get it unlocked until October, eve with the paid services, threatening to cancel,.and calling Nokia. whos going to u s i go to..
yes but is it worth it ? will the phone be unlocked ? $450 that's a steal, very competitive price. Too bad over here it will be around $800. Nice device, nice price!! Good luck Nokia!! Hei! Nice to hear from someone from little Latvija! I was wondering how much of us are there. Lol better sell it cheap. Thats the only way this Paper Weight will sell!!!!!!! WP8 is just horrible. The hardware on the Nokia is good. But the heavy, huge phone and crap software killed it. That is stupid cheap. I am stupid happy, stupid excited, and can actually afford that. Kinda makes me giggle..... Wonder how cheap the 820 will be off contract? So it is unlocked ? anyone know if I could buy it off contract and put it on tmo(US)? It looks like it's carrier-locked, but no contract. All I can say is Shyt got real!!! Nokia is seriously trying to push this phone to the masses at that price I will own it once I can confirm it can be unlocked through a third party until then I will own the new nexus!! For some reason I want to own the best device on each os (except apple) and with this price as well as the nexus price it can and will happen!! It came out to $484.86 total with tax. I live in California so I don't know what it is in individual states. It says it should come in Friday. w00t.